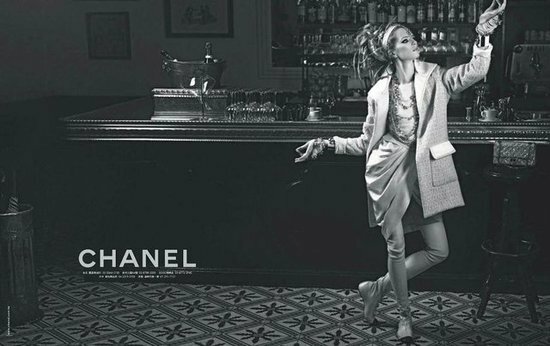 ‘India’ seems to be much in demand this week – first it was Sabyasachi taking top honours at Sotheby’s and now we have the first cut of Chanel’s Pre-Fall 2012 fashion campaign, which showcases clothes from the brand’s Metier d’Arts Paris-Bombay collection. The campaign has been shot by Karl Lagerfeld (but naturally!) and has Russian beauty Daria Strokous up-front-and-centre in a modern take on Indian fashion staples, like draped silks, fitted tunics, a treasure trove of jewels and poses that would make Bollywood feel proud! But what I personally can’t get enough of is Peter Philips’ evocation of the traditional-India-meets-contemporary-Europe beauty vibe: Dramatically kohl-rimmed eyes? Check. Golden highlights on the cheekbones? Check. Long lashes? Yep – it’s all there! Want to recreate the look? Check here for a detailed know-how.